I was 16 years old when I began taking voice lessons. My vocal teacher Dean Friedrich, told me I needed to learn every single vocal solo in Handel’s Messiah, cold. The book I sang from today is the book I bought when I began my vocal training, and I can remember how hard I worked on the solo I just sang for you, “The Trumpet Shall Sound.” It is the mother of all solos for baritones. The phrases demand a lot of vocal control and breath support, as well as memorization. And as I look back on my vocal career, I would guess I have sung this piece as a solo or in the Messiah around 50 times. Back when I was 16, I took little notice of the scripture that librettist Charles Jennens chose for this aria- I was more concerned about getting the notes and not screwing up before a large gathering of Messiah lovers. But the more and more I have sung this piece, the more I have pondered the scripture itself, and wondered why Jennens chose it in the first place. When I was doing my worship planning back at the beginning of Lent, I thought it would be fun to dust this solo off and sing it for special music, and then to preach on its contents, in particular because it has much to do with the Easter theme. Yet, as I dug into what Paul was trying to say about life, death, heaven and resurrection, I found myself struggling, and needing to go through a LOT of what scripture says about these concepts so that I would be able to paint a clear picture. And I began to wish that I had chosen something else to sing for special music! However, let’s try to delve into Paul’s understanding of this matter of life and death as set to music by one of the world’s greatest composers. To begin with, Paul was arguing a point concerning a letter he received in which apparently some Corinthian Christians did not believe Jesus rose from the dead. Furthermore, they did not believe that Jesus’ followers would be resurrected either. And as we come to today’s section of chapter 15, where Paul lays out just what those bodies will be like, and just how “We Shall Be Changed”, in order to fully understand these arguments and Paul’s beliefs about life after death, we need to look back a bit at our ancient faithful past. We need to look at the whole of scripture to understand where Paul is coming from. What did the early Hebrews believe about life and about what comes next? They did believe in both a soul and a body. In Genesis 2:7 we read that God breathed the breath of life into Adam, and he became a living soul. The soul was the ruach, the breath of God which gave the body life. One could fear for one’s soul (Ezekiel 32:10), risk one’s soul (Judges 5:18) or take one’s soul (1 Kings 19:4). There was an understanding of both body and soul- a dual understanding perhaps influenced by Greek thought at the time, around 800 B.C. Greeks believed there was an immortal soul and a mortal body. It is unclear of the early Hebrews believed the soul lived on when the body died. But this is idea of nothing after death is not clearly defined. As Hannah says in 1 Samuel 2:6, “The Lord kills and brings to life; He brings down to Sheol and raises up.” David wrote in Psalm 49:13-15, “This is the fate of those who have foolish confidence, the end of those who are pleased with their portion. Like sheep they are appointed for Sheol; Death shall be their shepherd; straight to the grave they descend, and their form shall waste away; Sheol shall be their home. But God will ransom my soul from the power of Sheol, for he will receive me.” And then there is Isaiah 26:19, where first Isaiah, written in approximately 700 B.C. says, “Thy dead shall live, their bodies shall rise. O dwellers of the dust, awake and sing for joy!” Even back in the 8th century B.C. there was a sense of more after death, and echoes of resurrection of the body. The idea of resurrection is further developed about 7 centuries later, in the book of Daniel. In Daniel 12:2-3, according to Daniel, many, but not all people will rise from the dead at an apocalyptic end time. Daniel says, “And many of those who sleep in the dust of the earth shall awake, some to everlasting life, and some to shame and everlasting contempt.” Those faithful would rise, not to a bodily existence on earth, but to a new form of life in heaven, shining like the stars. So, by the second century B.C., the Hebrew people believed in some form of both resurrection and eternal life. In the first century there was much debate about life after death, especially between the Pharisees and the Sadducees in the temple. Pharisees believed in an immortal soul, in an afterlife where God rewards the righteous and punishes the wicked, and in resurrection- They embraced this unfolding of eternity over the centuries expressed by David and others. The Sadducees, however did not believe in any afterlife whatsoever. They held onto the earliest beliefs of the ancient Hebrews. There is even a recording of their disagreements over the resurrection with Paul in Acts 23:6-9. Paul was on trial before the chief priests. He spoke to the council, calling himself a “Pharisee and son of Pharisees” and that he was being put on trial with respect to the “hope and resurrection of the dead.” Paul came from a long tradition of belief in life after death, and also about resurrection of the faithful. So now that the theological table has been set, just what is it Paul is trying to say about life after death as a Christian? I think first and foremost is that Paul wants the Corinthians to understand that Jesus being raised from the dead wasn’t some analogy or metaphor. This event wasn’t some made up way of covering over Jesus’ body being stolen. The resurrection of Jesus and then the subsequent appearance to a long list of witnesses in verses 5-8 is at the heart of the gospel. For Paul, without this foundational truth that Christ is risen, there would be no church because there would be no gospel. And yet for many Christians of today, although Jesus rising from the grave is part of our story, the notion of a bodily resurrection for the rest of us is uncomfortable, skipped over. 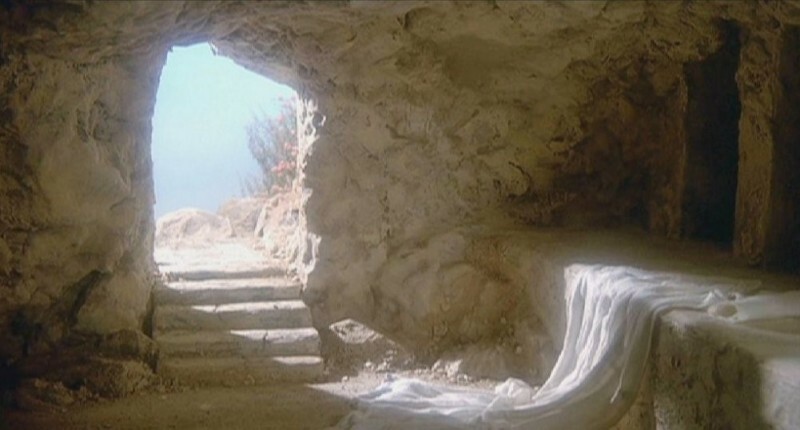 Surely it can be that Jesus rose from the grave, but why would anyone else want to have that happen? When we have a memorial service we talk about Jesus’s words in John, we focus on a loved one going to eternal life upon their death, not about their resurrection upon Christ’s return. Jesus didn’t say to the criminal on his right, “Today you will sleep until I return again, when you will be resurrected in bodily form.” Jesus knew that when the man died, he would experience an eternal reality in heaven with him right away. How then, do we deal with Paul’s understanding of life after death? What kind of body is a resurrected body? Is Paul talking about something like an animated corpse, a zombie like existence? If so, no thanks! I see enough of that on television and in movies, and want no part of it. But Paul believes the resurrected body is in a different form. Verses 27-41 map out Paul’s understanding of a resurrected body-. In verse 37, Paul uses the analogy of a seed becoming a plant-And what you sow (That is what is buried in the ground) is not the body that is to be, but a bare kernel, perhaps of wheat or of some other grain. But God gives it a body as God has chosen (that is the kernel grows into a plant- the dead body grows into a resurrected body, one of different form). Then Paul throws in other analogies of nature regarding animals, the sun and moon and stars. Then we get into today’s section of chapter 15. Whew! Finally! Paul continues- what is sown perishable (the dead body) is raised and becomes something new-imperishable, raised in glory. It is sown (buried) in a physical body, and raised as a spiritual body in a different form. Whereas our present earthly bodies are perishable, weak, dishonorable, sinful, the resurrected body will be raised imperishable, glorious and powerful. Then comes this discussion in verses 45-50 about Adam. He hearkens back to Genesis 2:7, when God breathed the Ruach into Adam, and he became a living being; the last Adam, that is Jesus Christ, became a living Spirit through his resurrection. Paul ties Adam to our earthly, mortal bodies of decay, and Christ to our resurrected, spiritual ones yet to come. He tries to tie things up with a clarifying statement in verse 50, I think, because he knows he has made the brains of the Corinthians hurt with his layered and complex arguments. “What I am saying, brothers and sisters is this: flesh and blood cannot inherit the kingdom of God, nor does the perishable inherit the imperishable.” The resurrected bodies we receive are imperishable, spiritual and in different form from our present bodies. Finally Paul answers a question which may not have even been asked by the Corinthians- What about those who are alive when Christ returns? What happens with them? He responds-“Behold, I tell you a mystery! We shall not ALL sleep, but we shall all be changed, in a moment, in the twinkling of an eye, at the last trumpet.” Even those alive upon Christ’s return will take on new forms and be raised. He then quotes from Hosea 13:14, and challenged the last enemy, death. For now, death still does occur. But upon the completion of all things, when the trumpet sounds and Christ returns, even death will lose its sting, will lose its power to invoke sorrow, fear and suffering. Because of this great hope in the fact of Christ’s resurrection, and ours one day, Paul says, therefore, we do not labor in vain.